On demand television like the BBC iPlayer has changed the TV habits of many users. Instead of waiting to tune into the live broadcast views can download and watch programmes at a time of their choosing and on a range of devices. Another media revolution has been status update/social networking sites like twitter. Ever wanting to engage with the listeners twitter is becoming the new ‘phone-in’ or ‘SMS text your thoughts’ for broadcasters. Whilst in the general populous there is still uncertainty over the benefits of sites like twitter broadcasters are already exploring how this technology can be used. 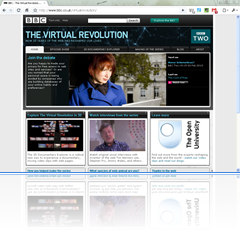 A case in point in the BBC/Open University The Virtual Revolution series which is exploring how 20 years of the web has shaped our lives. Its not surprising that a programme of this ilk is exploring how technology can be used to support the broadcast (including allowing viewers to mash-up and reuse clips from the series), it is also the first programme that I’ve seen broadcast a hashtag within its opening credits. The hashtag is a community driven invention which allows comments and content to be tracked across the web including in comments made as tweets. I find watching the programme with this backchannel communication is entertaining and for me adds a new dimension. There are perhaps educational uses to be explored such as engaging students in real-time discussion, asking them to critically reflect and evaluate what is being presented in real-time. Tony has been a valuable source for me in past, providing inspiration for my Twitter voting mash-up (TwEVS). Another of his ideas is a Twitter YouTube subtitle mashup, which extracts tweets to use as subtitles in YouTube videos of live events. Using exactly the concept I’ve come up with a way to allow a user to replay a downloaded iPlayer episode subtitling it with the tweets made during the original broadcast. So first to see the results in action. The video below shows the iPlayer playing ‘The Virtual Revolution: The cost of free’ displaying the tweets made during the live broadcast as subtitles. When you download a programme to watch using iPlayer as well as the video several other assets including a subtitle file in W3C Timed Text Authoring Format. To see this episode in full with twitter subtitles download The Virtual Revolution: The cost of free here. Once downloaded by default the programme should be saved in [My Documents] > [My Videos] > [BBC iPlayer] > [repository] > [obscure-broadcast-folder-name-like-b00qx4t0] (not sure what this would be for non-PC). To view with tweets open this folder and replace ‘obscure-broadcast-folder-name-like-b00qx4t0_prepared.xml’ file with this one [righ-click save link as], keeping the folder name at the beginning of the file name. When you play the video and turn on subtitles the tweets should be displayed. To create the XML file for any downloadable BBC broadcast I created a tool using the same concept as Tony’s subtitling YouTube example. Here is the Twitter Powered Subtitles for BBC iPlayer Tool I created. 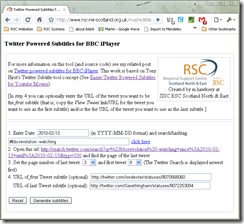 Whilst the tool was designed for the iPlayer it generates a timed text xml file which might be suitable for other applications. Hopefully the tool is straight forward to use all you have to do if find a programme with an active twitter back-channel (you might be surprised at how many their already are once you start searching). If you have any questions/problems post them in the comments below. Here is the code used for this tool (it also uses the SimplePie code library for handling the RSS). The code includes comments to describe what is going on. Feel free to edit, modify or build upon again use the comments below to share developments. Until that day an iPlayer one would be fantastic. Keep at it o geeky ones. @cyberdoyle – something for the future. You can already see manufactures trying to integrate social media into everything from your toaster to your tv. My tv at home has a twitter client http://twitgoo.com/34lcn – it’s rubbish but I like the concept. @Dan – Interested to hear how you get on; iPlayer on Mac is a bit of a mystery to me. Love the programmes philosophy to encourage mash-ups! Awesome. I am trying this as soon as I get home to my Mac. I just think its a great way to get people like me to turn the tv on in the first place. I have enjoyed many programmes on twitter without having tv on, but if I could do both… wow. The only reason I saw #bbcrevolution was because twitter reminded me. think its time the tv bosses got real and did a bit more research into the possibilities of this idea. it would cut both ways, more people would look at twitter, and more tweeters would turn tv on. Martin – I followed the link but the video won’t play. It might be my crap connection but I don’t think so, others play.